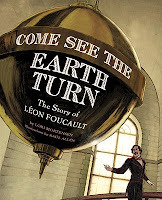 Come See the Earth Turn by Lori Mortensen, illustrated by Raul Allen. Grades 2-5. Tricycle Press, 2010. Unpaged. Review copy provided by publisher. This book was nominated for a 2010 Cybils award and this review reflects only my own opinion! In 1819, a baby boy was born. He wouldn't be good at school, often falling behind his classmates. He would never go to college and earn a fancy degree. But he would change the scientific community forever when he proved for the first time that the world turns. Leon Foucault was a French scientist who developed the Foucault pendulum, a giant pendulum that shows plainly the motion of the earth. The pendulum swings independently from the rotation of the earth, so when it moves away from its straight line, you know it's not the pendulum that has shifted, but the earth! What I like best about this book is that it features a kid who wasn't good at school. Young Leon "was a tortoise among jackrabbits", often turning in homework late because it took him much longer than it took the other children. You know there are kids who will identify with this, and Leon's eventual triumph shows them that they, too, can succeed. Leon figured out that he was good at building things and that started him on his path. And then this man without a degree, who had so much trouble with school, did something no one else in the scientific community could do! The illustrations pair nicely with the text, dark and rich. Some spreads have inlaid panels reminiscent of graphic novels, which will grab a kid's attention. Lori Mortensen completes the book with a nice bit of back matter, including an author's note giving more information about Foucault's later life, a glossary, and a nice bibliography citing print and web resources. Come See the Earth Turn is a book that will appeal to young scientists. Share this book with your kids before your trip to the museum so they can really know what they're looking at when they see that giant pendulum! It's on shelves now. It's Nonfiction Monday!!! The roundup is over at Charlotte's Library, so go check it out!